Completed my first 16-mile run today as part of Marathon Training for the Portland Marathon on October 6th. Finished in a little over 3 hours with a final temperature of 90 degrees. Welcome to Kansas: Land of Humidity. Longest run I’ve done. EVER. But now that I’ve survived the Sweaty Sixteen, I’m now working on the 10 Breadstick Challenge. 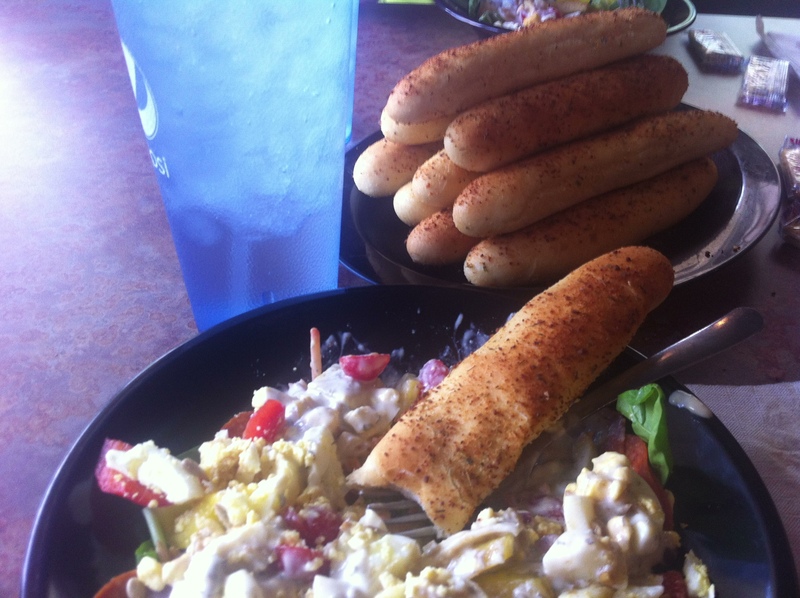 By the end of the day, I will have eaten this entire plate of breadsticks, pictured below. (In case you’re wondering, that’s a spinach salad in the bowl. Uh, the spinach is there…somewhere). The only reason this plate hasn’t been demolished is because we ordered our food. But halfway through the salads we were pretty much ready to fall asleep so we took our food home to go and then took a NAP. These are from Gambino’s Pizza in Lenexa, KS, in case you need to reward yourself after a run. Posted on August 24, 2013, in Exercise, Food, Going Local, Humor, Marathon, Mountain Dew, Running and tagged Breadsticks, Gambino's Pizza, Humor, Marathon Training, Mountain Dew, Portland Marathon, Shawnee Mission Park. Bookmark the permalink. 2 Comments. I’ve had to cancel my plans of running the Portland Marathon this year because of an injury, but it’s going to be such a fun event! Good luck with your training!